Continuing on from part one of our Carpentry and Joinery terms, this post sees us looking at C-E, from Calf to EX and everything in between! The wedged shaped part of a Scarfed Joint. The rising at the centre of a horizontal structural member to counteract sagging. A Cabinet Maker is someone who specialises in the making of shelving, furniture and cabinets. A cylindrical moulding carved to imitate a rope. A planted piece on the top of a post for weathering or ornamentation. Sometimes referred to as Capillary Attraction is the phenomenon whereby moisture can travel against the force of gravity in fine spaces or between two surfaces which are close together. The smaller the space, the greater the capillary attraction. A groove which can be found on the underside of window/door cills and weather mouldings; the groove acts as a break to stop the capillary action of moisture from reaching the brickwork. Also known as a Drip or Drip Groove. A long length, serving as a cap for gates and framing. The frame or main parts of anything, before it is completed with coverings (eg. T&G boarding or paneling). Generally speaking, Carpenters are involved in work that does not need finishing, such as the erecting of structures (i.e. roofing, shuttering etc.). An old phrase used to differentiate between a Carpenter and Joiner is ‘A Carpenter uses nails whilst a Joiner uses screws’; however, the differences have become somewhat blurred these days. A condition of stress in the adjacent layers of timber due to incorrect seasoning, causing the the wood to warp when further machined. A glazed sash hung by hinges or pivots. Also, a hollow moulding less than half a circle. The mould or timber frame used as a support when turning an arch. The temporary timbering used for supporting the component parts of an arch whilst building. A carved moulding imitating the links of a chain. A Dado rail. A horizontal moulding fixed to a wall to prevent the chair backs from damaging the decoration. A corner bevelled so that the Arris is removed equally on each face of the material. When it is unequal, it is termed a Bevel. A mortice with a chase, so that the stub tenon can be slid into position sideways instead of lengthways. The sides of a mortice, or the removed sides of a tenon. The horizontal member at the bottom of a frame. Also known as a Sill. A space between two surfaces to prevent contact, as between the edge of a door and the frame. A short nail with a large flat head, for fixing cords, felt and plasterboard. A large screw with a square or hexagonal head that is driven in using a spanner. Applied to timber with wide annual rings due to rapid growth. An older plane also known as a Universal Plane, and capable of producing nearly every moulding, ploughing, rebating, etc. The main rafters in a roof carrying the slates or tiles and running from the Wall Plate to the Ridge. Also known as Spars. A smoothing plane for circular work (below right). The sole of the plane is adjustable by means of of the screw for either concave or convex surfaces. A bay window, circular in plan. A groove to collect the condensation on the inside of sashes. A Weep Hole allows the moisture to escape to the outside. Adjusting the moisture content of wood. Sawing timbers into smaller sections. The loose waste timber from a mortice. The interior of plywood or any solid wood forming a base for veneering. A covered entrance to a churchyard (Right). More commonly known as a Lych Gate. To prepare a screw hole so that the head of the screw is flush with the surface of the material. Rafters nailed together at the top and tied at the feet, or by a collar beam up the roof. Tightening-up the joints of framing, etc., by means of cramps. Mouldings that are notched or indented in the form of battlements. A strap hinge (Right) shaped like a letter T and more often referred to as a T or Tee Hinge. Also known as Diagonal Grain or Oblique Grain, Cross Grain is the term applied to converted wood in which the fibres do not run parallel to the axis of the timber. A shake in timber caused by the separation of the Annual Rings. The lower part of a wall from the skirting to the Dado Rail. A horizontal moulding fixed to a wall to prevent the chair backs from damaging the decoration. Also known as a Chair Rail. The line on a building site from which all heights are measured. The act of making floors, partitions, etc., soundproof. A knot that isn’t firmly joined to the surrounding wood. A decayed knot in timber. The forces acting upon a structure due to gravitation. The weights of the different materials. A lock operated by a key only. Projections on the face of a moulding formed by removing alternate parts of the fillet on the moulding. The act of drying timber in artifically heated chambers, i.e. Kiln Drying. A disease in timber giving a spotted, speckled apperance to the timber. A strong iron fastening for heavy timbers in structural work. Stairs consisting of two or more flights, in which the returns are made from the same Newel. An ornamental moulding with carved projections in the form of small pyramids. An alternate name for the Jambs of a solid door frame. A solid frame for a door. A horizontal member connecting the foot of the Jambs of a door frame.The Capillary Groove (A) is the smaller of the two groove and this side of the Sill protrudes to the exterior. The other groove (B) is the Mortar Groove. The edge of the rebate against which a door closes. A window in a sloping roof, having vertical casements. A sash and frame window in which both pairs of sashes are hung. A single door giving the appearance of two doors. A joint in which the pieces are end to end and forming an angle. The Dovetailed joint is made by forming pins in the shape of a dove’s tail. A steel plate used for making and shaping dowels. Cylindrical pieces of wood useds as pins for securing joints. The space which is closed up in Draw-boring. The act of tightening a joint at the shoulder by means of a pin. The hole in the cheeks of the mortice is a little in advance of that in the tenon. A cutting tool with two handles (below), used for cutting large chamfers. The timber to be worked is secured in the vice and the knife if pulled towards the user with the bevel edge facing down and held into the timber. Stuff that is planed up. A disease in timber, caused by a wound in the cambium layer being attacked by fungus. Decay in timber caused by a fungoid growth. It is usually the result of a moist, stagnant atmosphere, such as can be found under badly ventilated floors. Refers to the durability of timber, which is how long a sample of timber is expected to last in it’s untreated form. There are five durability classes which range from ‘non-durable’ upto ‘very durable. You can read more in our timber durability guide here. A door which is too low for ordinary traffic without stooping, usually less than five foot high. The bottom edge of a sloping roof where the water is collected in the gutters. The strips on the edges of flush doors to secure and cover the edges of the plywood. They are also called Bandings, Clashings, Margins, Slamming Strips etc. A drawing showing the front view of an object. To form designs in raised work. The ornamentation is prominent. The exposed end of a piece of timber after it has been cross cut. Boarding tongue and grooved on the ends. A generic term covering a wide variety of timber based products that have been engineered to enhance performance. Includes boards such as: Plywood, MDF, Plywood, Blockboard, Chipboard and Gluelam beams etc. New timber regulations brought in by the European Union in March 2013. The regulations prohibit the use of ‘Illegally harvested timber or products derived from such timber’ and those of us who buy and sell timber within the EU market have to meet certain legal obligations. Also known as the EUTR, you can read a bit more about it here. A metal plate fixed around a keyhole. A bolt that fastens in three places in one operation. It can be used on French windows and fastens the window at the bottom, top and at one or more intermediate positions. An upper window over which the eaves are raised in the form of a flat segment. Meaning ‘out of’ or ‘from’. For example, if you were having a pair of garage doors manufactured that were described as EX 50mm thick, then generally they would finish at approx. 45mm thick once the timber had been planed up. Derives from Latin. 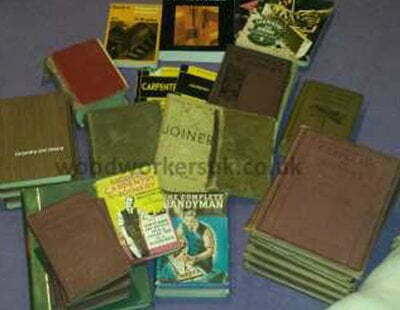 We will be back shortly with part three of our Carpentry and Joinery glossary. In the mean time, if you have any Carpentry and Joinery terms to add, then please use the comments box below. Don’t want to be ‘picky’ but wouldn’t this be better for Coach Screw? Thats being picky lol! I’ve changed the description above, well spotted! I’ve got to be honest and say I’ve never heard of it before. There is what is called clocking, which is where you line up the heads of the screws so the slot heads are all in the same position but not heard of Church and Chapel? Where did you hear of this? Thanks, I heard form an old carpenter many years ago, nobody seems to remember it – all use Phillip heads now anyhow! I’ve asked on Twitter for you and will let you know if I get an answer!